At Google, we’re passionate about empowering children to create and explore with technology. We believe that when children learn to code, they’re not just learning how to program a computer—they’re learning a new language for creative expression and are developing computational thinking: a skillset for solving problems of all kinds. In fact, it’s a skillset whose importance is being recognised around the world—from President Obama’s CS4All program to the inclusion of Computer Science in the UK National Curriculum. We’ve long supported and advocated the furthering of CS education through programs and platforms such as Blockly, Scratch Blocks, CS First and Made w/ Code. 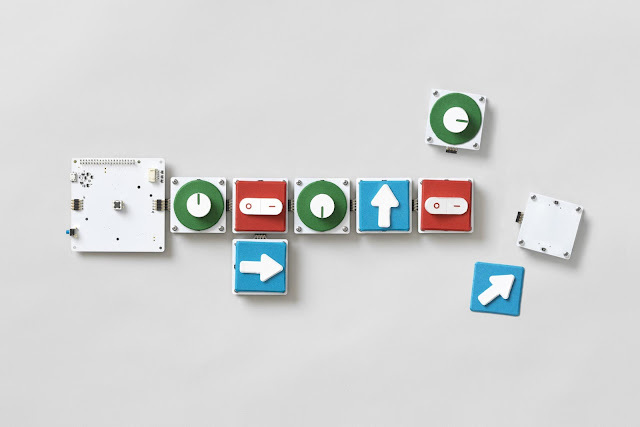 Today, we’re happy to announce Project Bloks, a research collaboration between Google, Paulo Blikstein (Stanford University) and IDEO with the goal of creating an open hardware platform that researchers, developers and designers can use to build physical coding experiences. As a first step, we’ve created a system for tangible programming and built a working prototype with it. We’re sharing our progress before conducting more research over the summer to inform what comes next. Kids are inherently playful and social. They naturally play and learn by using their hands, building stuff and doing things together. Making code physical - known as tangible programming - offers a unique way to combine the way children innately play and learn with computational thinking. Project Bloks is preceded and shaped by a long history of educational theory and research in the area of hands-on learning. From Friedrich Froebel, Maria Montessori and Jean Piaget’s pioneering work in the area of learning by experience, exploration and manipulation, to the research started in the 1970s by Seymour Papert and Radia Perlman with LOGO and TORTIS. This exploration has continued to grow and includes a wide range of research and platforms. However, designing kits for tangible programming is challenging—requiring the resources and time to develop both the software and the hardware. Our goal is to remove those barriers. By creating an open platform, Project Bloks will allow designers, developers and researchers to focus on innovating, experimenting and creating new ways to help kids develop computational thinking. Our vision is that, one day, the Project Bloks platform becomes for tangible programming what Blockly is for on-screen programming. We’ve designed a system that developers can customise, reconfigure and rearrange to create all kinds of different tangible programming experiences. The Project Bloks system is made up of three core components the “Brain Board”, “Base Boards” and “Pucks”. When connected together they create a set of instructions which can be sent to connected devices, things like toys or tablets, over wifi or Bluetooth. Pucks are what make the Project Bloks system so versatile. They help bring the infinite flexibility of software programming commands to tangible programming experiences. Pucks can be programmed with different instructions, such as ‘turn on or off’, ‘move left’ or ‘jump’. They can also take the shape of many different interactive forms—like switches, dials or buttons. With no active electronic components, they’re also incredibly cheap and easy to make. At a minimum, all you'd need to make a puck is a piece of paper and some conductive ink. Pucks allow for the creation and customisation of endless amount of different domain-specific physical instructions cheaply and easily. Base Boards read a Puck’s instruction through a capacitive sensor. They act as a conduit for a Puck’s command to the Brain Board. Base Boards are modular and can be connected in sequence and in different orientations to create different programming flows and experiences. Each Base Board is fitted with a haptic motor and LEDs that can be used to give end-users real time feedback on their programming experience. 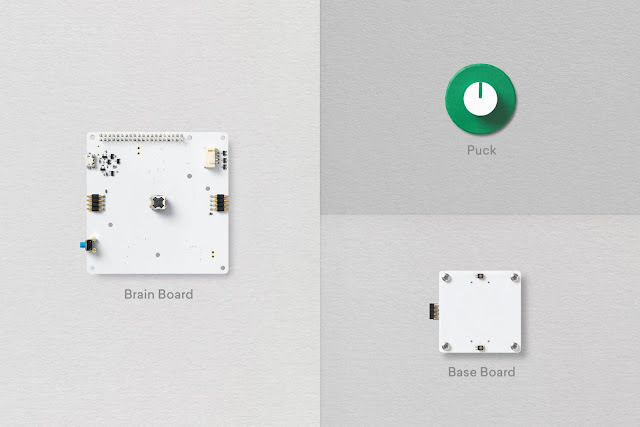 The Base Boards can also trigger audio feedback from the Brain Board’s built-in speaker. The Brain Board is the processing unit of the system, built on a Raspberry Pi Zero. It also provides the other boards with power, and contains an API to receive and send data to the Base Boards. It sends the Base Boards’ instructions to any device with WiFi or Bluetooth connectivity and an API. As a whole, the Project Bloks system can take on different form factors and be made out of different materials. This means developers have the flexibility to create diverse experiences that can help kids develop computational thinking: from composing music using functions to playing around with sensors or anything else they care to invent. 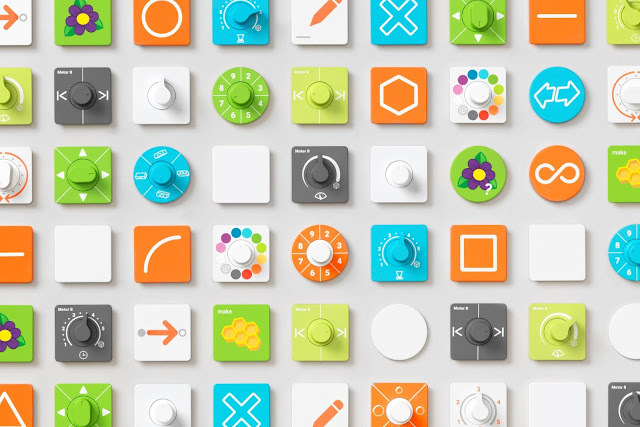 To show how designers, developers, and researchers might make use of system, the Project Bloks team worked with IDEO to create a reference device, called the Coding Kit. It lets kids learn basic concepts of programming by allowing them to put code bricks together to create a set of instructions that can be sent to control connected toys and devices—anything from a tablet, to a drawing robot or educational tools for exploring science like LEGO® Education WeDo 2.0. We are looking for participants (educators, developers, parents and researchers) from around the world who would like to help shape the future of Computer Science education by remotely taking part in our research studies later in the year. If you would like to be part of our research study or simply receive updates on the project, please sign up. If you want more context and detail on Project Bloks, you can read our position paper. Finally, a big thank you to the team beyond Google who’ve helped us get this far—including the pioneers of tangible learning and programming who’ve inspired us and informed so much of our thinking.